Spring has sprung and all around us the flowers are blooming, the sun is shining, and everyone’s wearing pastels. Ok, maybe in some dream world that’s happening, but as designers that’s what we do, paint beautiful dream worlds with our designs and use of typography. So now that Easter is here, you may need to create some promotional materials for a client that paints that perfect Spring-like dream. I’ve selected 5 100% free for commercial use fonts that would lend themselves perfectly to your Spring design. First on the list is my favorite, Garineldo No01. 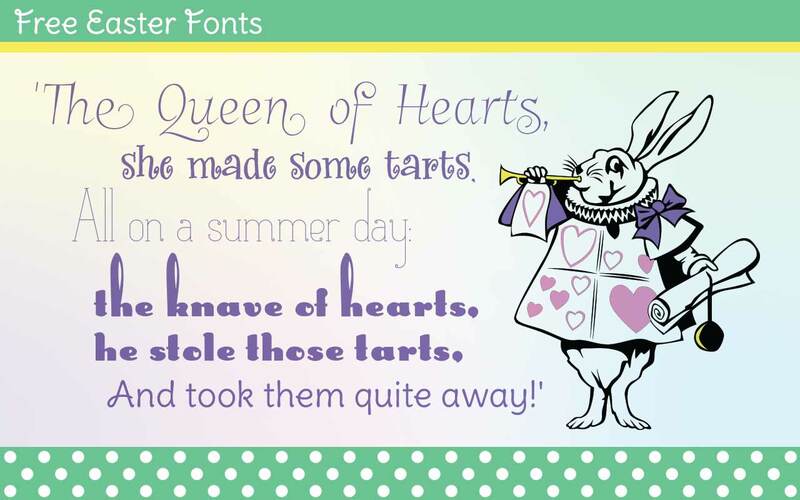 This is the perfect Spring font with gorgeous swashes that resemble the delicate tendrils of a pea vine. I recommend using this font with the standard ligatures feature (liga) activated. It makes letters ligate perfectly and also improves the space between words. Next on the list is Kwekel. Kwekel has a fun organic texture with curly terminals perfect for that flowery garden feel. Matilde is a great thin type font and comes not only in regular but also sketch for a more hand drawn look. The tiny ball terminals and unbracketed serifs provide a clean and unique design. Lastly, Delius Swash Caps rounds out the list with its fun use of swash serifs on capital letters. They resemble poofy little bunny tails and the clean lines and ease of readability make this one a sure winner.